Valentine’s Day is less than 2 weeks away. How the heck did this happen? Over the next week I’ll be sharing a few delicious recipes you can cook for the one you love this Valentine’s Day. 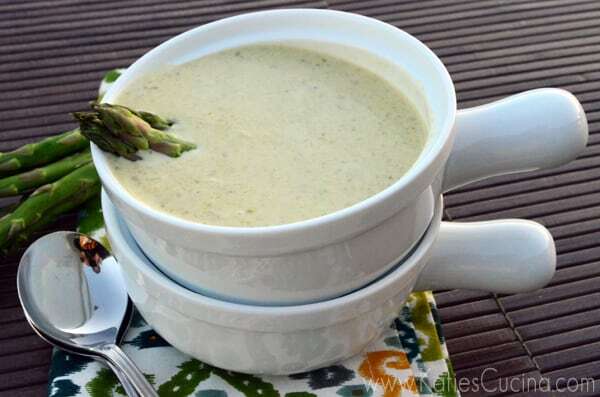 Let’s start with this Cream of Asparagus Soup. You can make this right before dinner or make it ahead of time and reheat the night/day your serving it. Just because you might not be going out to a fancy restaurant this v-day doesn’t mean you can’t make fancy food at home. If you do chose to stay home, make your meal extra special. Don’t just make a main course and dessert. Serve several courses just as if you were dining in a 5 star restaurant (of course for a fraction of the cost). Start with a salad like my Beet, Tomato, & Artichoke Salad, then move on to Cream of Asparagus Soup, and then maybe make Steaks with Mushroom Sauce and a little Cauliflower-Leek Puree. Finish off your meal with Puff Pastry w/ Strawberries & Cream. Most of the recipes can be prepared a head of time or at least some of the ingredients can be prepared ahead of time like slicing strawberries and mushrooms, etc. Normally, we stay home and make a meal together, which is rare since my husband is not the cook in the house, so its a nice welcomed change. It’s nice to cook together every now and then–it makes the meal that much more special. At least it does in our home. This year, since its our last kid-free Valentine’s day I’ve insisted we go out to dinner. This is the last year (for a very long time) that we won’t have to worry about getting a babysitter on Valentine’s day! I don’t care how over-priced the meal is–we are taking advantage of our last few carefree weeks of no babysitting scheduling needed. In the 12 Valentine’s days we have celebrated together–that is something we have never had to worry about and as it crossed my mind this year I realized we need to enjoy our “last” holiday together as 2. I then started to try and imagine how different next Valentine’s day will be. I envision a baby, sitting in between us in his high chair as we take turn feeding him peas and mashed potatoes! More reasons why we are going out this Valentine’s day. But if you are in our shoes that we will be in next year–make a nice multi-course meal at home and try to enjoy a few minutes together without interruption (easier said then done as I’m told by friends with kids). In a large stock pot, add olive oil and 1/2 inch pieces of asparagus tips. Cook for 5 minutes on medium heat with lid on until asparagus has started to soften. Then add chicken broth to the pot. Cook on high with lid on for 25 minutes. During the last 5 minutes add the asparagus tips and cook until just tender. Remove the tips and set to the side. 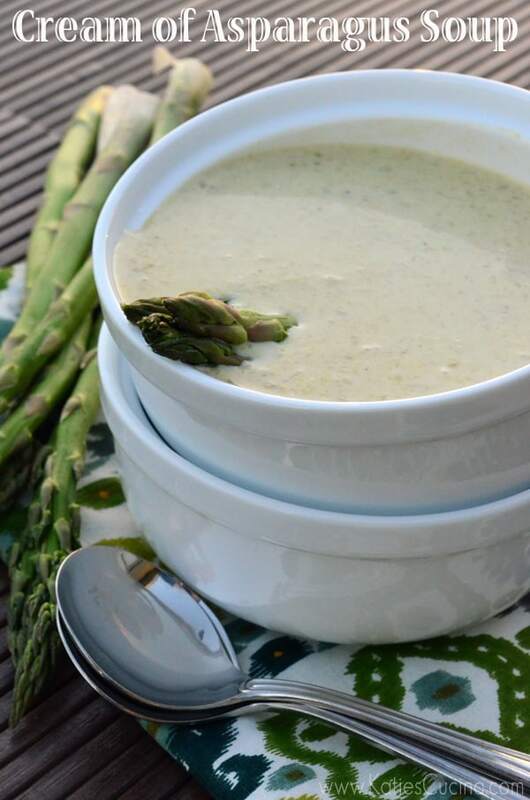 Once the asparagus is done, carefully pour the broth and asparagus into a blender. Blend until pureed (about 20-30 seconds). Return back to the stock pot. Add salt and pepper and heavy cream. Cook for 5 minutes on medium-high until cream has thickened and soup is hot. Serve immediately with freshly ground black pepper and steamed asparagus tips. Feel free to strain the soup if you don't like the added texture from the pureed asparagus stalks. Yes, this would be perfect for a first course of a stay at home Valentine’s Day dinner! Sounds delish!